Schedule risk analysis is increasingly considered an integral part of the project management process and in particular the quantitative analysis of risk impacts on cost and schedule. However, the risk analysis capabilities are extremely limited. In Microsoft Project Server it is possible to identify risks, assess probability and impact as well as assign to project activities, however it does not provide the project managers any insight into what the actual impacts of risks will be if they occur during project execution. Quantitative risk analysis will prioritize risks and provide cost or schedule impacts that allow project managers and the project team to develop risk response plans to address the scale of the risks if they occur during the project. 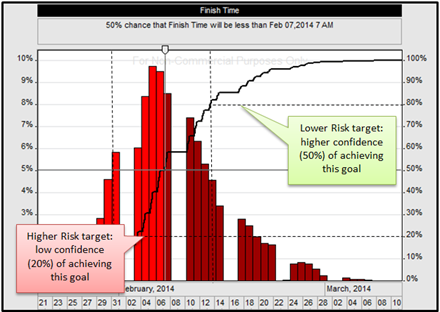 Common quantitative project risk analysis techniques include PERT and Monte Carlo simulations. In previous versions of Microsoft Project (up to 2007), an integrated PERT capability was included. PERT (Program Evaluation and Review Technique) was developed in the 1950’s as part of the Polaris missile program to incorporate schedule uncertainty as part of the project management. In conjunction with the base durations for each activity, PERT incorporates optimistic and pessimistic estimates (3 point estimates) to account for schedule uncertainty. Using a weighted average of the 3 estimates, PERT calculated an expected duration for each activity in the schedule and therefore the expected duration of the entire schedule is the sum of the precedent network. Running the PERT in Microsoft Project is very simple as all it required was to add optimistic and pessimistic estimates for durations and then run the PERT calculation to generate an expected value for duration and finish times for a schedule. However, the PERT method has well known drawbacks. The expected duration are only accurate if there is one dominant (critical )path in the precedent network. In larger, more complex projects, there can be multiple critical paths depending on how risks or uncertainties affect the project. Due to this, PERT typically provides a overly optimistic expected values for project schedules. PERT features are no longer provided by default with Microsoft Project 2010 and later versions. A more appropriate schedule (and cost) risk analysis methodology for larger more complex projects is Monte Carlo simulations. Monte Carlo simulations is a statistical method that uses 3 pt. estimates in conjunction with statistical distributions (triangular, normal, beta, etc.) to generate stochastic results that can be used to determine the probability of meeting specific project schedule or cost objectives. Monte Carlo runs hundreds or thousands iterations of a project schedule. In each iteration, the simulation use as inputs random values for each activity variable (duration, cost, etc.) taking into account the defined input statistical distribution. With these values, the Monte Carlo calculation engine generates outputs (results) for a single project. The simulation runs simulations until there is an adequate representation of all possible results to provide an accurate probabilistic model of the project. The results include critical path, duration, start times, finish times, cost for the project and each activity. Using these results you can generate data or visualizations which indicate whether your current project cost and schedule objectives are realistic and perhaps should be adjusted to take into account uncertainties. 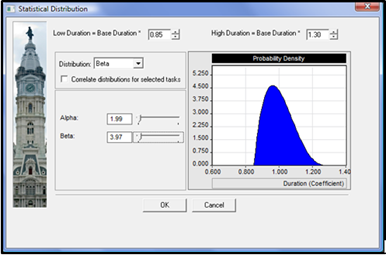 You can perform Monte Carlo simulations in Microsoft Project 2010 using Add ins such as provided by RiskyProject. RiskyProject’s Addin for Microsoft Project installs an additional tab on the Microsoft Project ribbon and provides a quick and simple method to run your project risk analysis. After calculation you can present results to understand how risky your current objectives are and what adjustments may have to be made to your project to meet those objectives. Particularly you may view statistical distribution for project duration, cost, finish time as well as statistical distributions for each activity. It is important to note that in RiskyProject add-in for Microsoft Project all input distributions are saved in Microsoft Project MPP file. Therefore when you open Microsoft Project schedule, you may view and modify statistical distribution or repeat a calculation. Using tools such as RiskyProject’s Microsoft Project Add-in provides project managers powerful tools to understand what might happen to their project given uncertainties in schedule and cost. This insight allows for improved forecasts of project outcomes and allows project teams to put in place adequate contingency and reserves to account for the project risks and uncertainties.